26 inch wheels used to be the standard size on mountain bikes, with everything from cross-country racers to hard-hitting downhill bikes sharing the common standard. Today, 26 inch wheels are only found on jump bikes, junior bikes and occasionally on extra-small mountain bikes where anything larger won’t fit. The beginning of the end for the 26 inch wheel came in the mid 2000’s, when 29 inch wheels started becoming popular. Although the larger diameter wheels had been around in various guises for quite some time, there were few commercially available bikes which used them. The advantages of a 29’er wheel were touted as lower rolling resistance and increased grip, both of which have universal appeal in an environment filled with rough terrain and loose surfaces. Within just a couple of years, 29ers became the wheel size of choice on short-travel cross country bikes – particularly hardtails. However, the added weight & rotational inertia made them unpopular with more aggressive mountain biking styles, like all-mountain and downhill racing. The larger wheels made the bikes feel cumbersome and difficult to manoeuvre around tight courses, and the added size made it difficult to design suspension linkages that worked well with them. For several years, 26inch wheels lived alongside 29’ers peacefully, until 27.5 inch (650b) wheels reignited the flames. Riders were acknowledging the benefits of 29er wheels, but the drawbacks of the large size were just too much. In the late 2000s – early 2010’s, 27.5 inch wheels appeared in many manufacturer’s ranges alongside 26 and 29 inch wheels. The ‘new’ wheel size is also much older standard, originally known as 650b and (according to Sheldon Brown) has also been used on French utility bikes and tandems. 27.5 inch wheels largely address the issues riders were having with 29’er wheels, while still offering most of the benefits of the larger size. They have a lower rolling resistance and more grip than 26 inch wheels, and are significantly lighter and more manoeuvrable than 29 inch wheels. 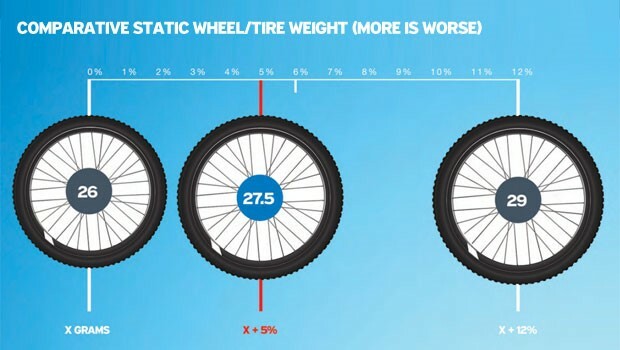 To help clearly demonstrate the differences between the three mountain bike wheel sizes, Giant released a series of comparisons to show why the larger wheels have taken over from the traditional 26 inch wheel. In the simplest of terms, the more tyre you have in contact with the ground, the more grip you have. This is most noticeable under braking and when pedalling hard on loose ground, and is also a benefit during hard cornering. A larger wheel diameter has a shallower angle of attack to the ground, which reduces the rolling resistance. This is harder to visualise, but you can think of it as a short man and a tall man walking up a flight of stairs. The short man takes one step at a time, because he can’t bend his knees enough to take two steps. The tall man has longer legs, so taking two steps at a time is much easier, and he gets to the top faster than the short man. A bigger wheel means more weight. More weight means less manoeuvrability and a heavier bike to pedal up hill. While 29’er wheels are much heavier than 26 inch wheels, 27.5 inch wheels only have a slight amount more weight. Compared to a 29’er, the weight penalty of a 27.5 inch wheel is a lot less, while the performance gains are almost as high. A wheel doesn’t start turning on its own, and getting a wheel up to speed takes energy. Once again, because the weight penalty of a 2.5 inch wheel is much less than a 29’er, they can accelerate much quicker, and are only fractionally slower than 26 inch wheels. Which wheel is the best? There’s no such thing as a perfect wheel size for all riders. Depending on the type of riding you’re doing, you may prefer the smooth rolling efficiency of a 29’er, the all-round balance of a 27.5 inch wheel, or the lightweight & nimble handling of a 26 inch wheel. Taller riders may prefer larger wheels, while shorter riders may prefer smaller wheels too. For the most part, it boils down to personal preference. However, if you’re torn between two bikes with two different wheel sizes, please feel free to ask our expert advice by calling 01792 583 000, or you can chat to us using our Live Help service.